You are never too old to play with Legos. The Legos of 2012 are much more than simple bricks for building. As I watch the children working with Legos, I am always amazed at what they come up with during their free building time. I have seen elaborate scenes where the children use the classic “mini figures” to reenact movie scenes, complete with motorized escapes or a small pile of gears that is easily turned into a self-propelled walking android. As remarkable as their free build can be, the most interesting part of all is the ongoing conversation between the students while they are building. The classes are appropriately named “Lego Engineering” because that is exactly what they are doing! Through the use of Legos, these students have been taught about structure, torque, speed, lift, and other complex physics principals that I only wish I had learned at such a young age. I once made the mistake of asking a six year old student how the “rubber band” helped the car to move. With a straight face and a look well beyond his years, the student looked up at me and said, “It is not a rubber band. That is a belt, and it is linking the pulleys in my car. The front pulley is attached to the motor which drives the back pulley attached to the axel. A rubber band is an office supply!” I knew then and there that my houses and castle designs were no longer the extent of what children could do with Legos. Just yesterday I walked into class and the kids were in the midst of a team build. They split into different teams and were all responsible for creating a different component of what was to become a boomed crane like we see around the city lifting heavy loads to create buildings. As groups, the students discussed overlapping for structure and gearing to reduce the weight load being lifted. Over the last year I have come to understand the brilliance of what these small plastic bricks have become. It has spawned birthday parties, cult like followings for the rarest of sets, and theme parks, but above all, it is a creative catalyst and one of the greatest educational tools ever made. Children are able to learn basic physics principles and have a wonderful time while doing so. On Sunday May 20th the DCJCC will be hosting Camp-A-Palooza. At this event campers will get a chance to meet counselors and experience “a day of camp.” Play Well-Teknologies will be on hand that day and, with the aid of the kids, they will attempt to make a structure that is 30 feet tall! You might see a plastic brick. They see unlimited potential! 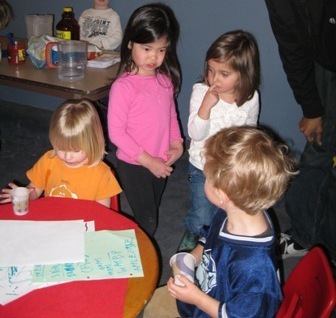 The Peelim (“elephants”) class recently opened a café in the Preschool Lobby. Their menu was initially to serve cupcakes, cakes, brownies, chocolate milk, fruit, and possibly sandwiches (the owners could not come to a consensus). Imagine this reviewer’s pleasant surprise when the menu showed a wider range of culinary options. In addition to the menu board, they had charmingly hand-decorated menus. The servers are quick to offer suggestions as well as seconds on all items. The chips and salsa are quality, the grapes nicely sliced for neat bites and the brownies were moist and richly chocolatey. If you’re in the mood for an eclectic afternoon snack in a warm atmosphere, we highly recommend the Peelim Café. Now open some weekdays after nap in the Preschool Lobby while the Peelim class of four-year olds continues their Restaurant Project. 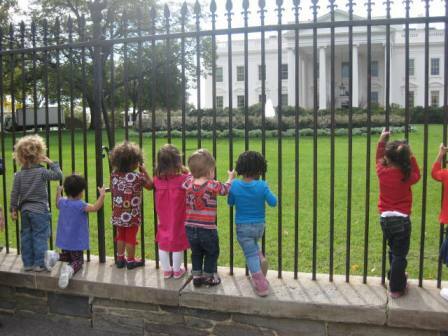 Our White House exploration began with an interest in the American flag. The Gamalim noticed that the DCJCC has a very large flag in front of it, and they excitedly pointed out the American flag whenever we walked to and from Stead Park. Soon they began to notice other flags as well. The Gamalim teachers found books on flags and on DC, since many books on DC have American flags in them. One of the DC sights featuring a flag is the White House, and when the Gamalim discovered that the J is on the same street as the White House, they decided we should visit! We walked a mile to the White House on the walking rope. The Gamalim were disappointed we could not go through the gate, but they decided that they wanted to know more about what was on the grounds. To continue our ongoing exploration, we have added more books on the White House and other DC icons. We have sketched the White House and learned all about the different rooms and who works in them. On Tuesday, we had a fancy White House lunch in the classroom, using a tablecloth and our very best table manners. One friend brought in photos of her experience at the White House Easter Egg Roll, and another friend brought in her book about the Obama’s dog, Bo. One parent is going to help us get a tour. The Gamalim also worked hard to craft a letter to President Obama, asking him if we could go inside the White House to see more. We wrote several drafts and spent a lot of time thinking of good questions to ask. All of the Gamalim signed their names at the bottom of the letter. We are anxiously awaiting the President’s reply! We are the Gamalim class of the Jewish Community Center (JCC) in Washington, DC. We are two years old. We walked to the White House last week, but we couldn’t go in. We’d really like to go inside. We want to visit the Blue Room, the Gold Room, the Yellow Room, and the Red Room. We want to see the Oval Office, and all the other rooms. Please can we go in the White House? President Obama, why do you work? Pay to Play? What is “free” play? In our Preschool, we’ve been using “Free Play” freely (if you’ll pardon the pun) to describe what our students do in the classrooms first thing in the morning. 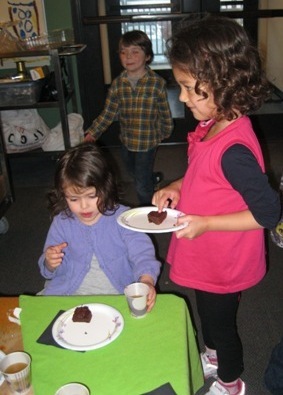 It implies that the play is child-directed, free of adult interference. That it’s loosey-goosey, aimless or perhaps a little anarchic. But the more I think about it, is this really what we want to convey when we talk about the children’s play? Yes, play should be child-directed, but that doesn’t happen without teachers creating an environment that encourages exploration, independence and curiosity. For example, teachers in the PreK-4 class added gourds (uncut) and leaves to the sensory table in anticipation of autumn and Sukkot. The teachers didn’t then ignore the provocation or alternately tell the children what to do with the gourds—they watched and saw where the children went and followed their lead. And they stepped in to help only by asking questions or talking to a child who was maybe considering throwing one. Later in the morning, they satisfied the children’s curiosity by cutting them open (no easy task the teachers and students discovered!) during Small Group Work. So we could replace the word “free” with any of these: choice, independent, spontaneous, open, exploratory, guided. Or my preference: intentional. 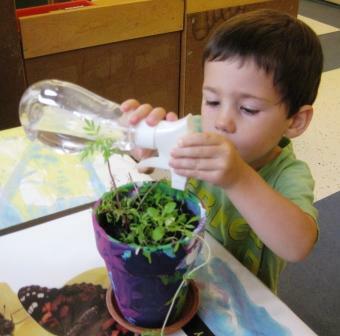 “Intentional Play” gets the best of both worlds: it implies planning on the teachers’ part, thought on the children’s part and the message that children learn through play. So starting today, let’s start a revolution: let’s call it Intentional Play. You can even use Microsoft Word’s “find and replace” function to find the phrase “free play” and replace it with “intentional play” wherever it’s found. It may not seem revolutionary, but it’s a shift in thinking which will lead to a shift in action. If you want to add an intention to play to your own life—perhaps as a goal for the Jewish new year—all the better. Additional Reading: What Should a 4-Year Old Know?